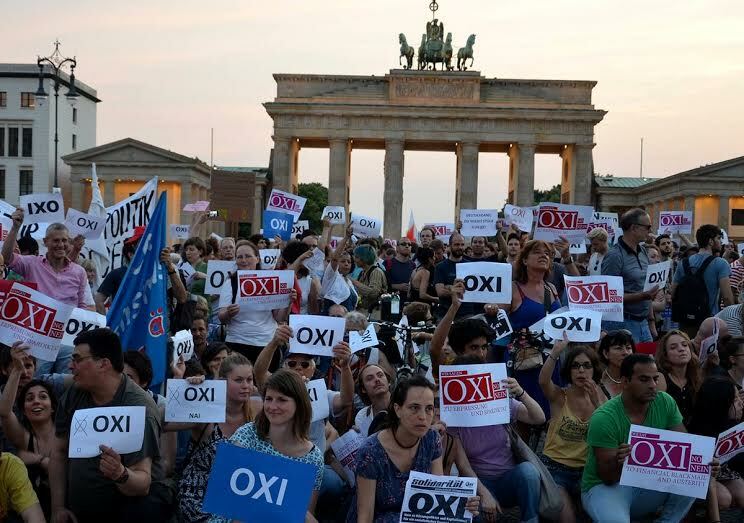 Oxi No Nein: German solidarity with Greek ‘Oxi’ vote against austerity. Guest article by JoJo, a Fightback correspondent based in Germany. In the last few months the development of the left in Greece has been watched with interest by leftists all over the world. The austerity policies against which the Syriza government and social movements tried to fight were imposed on Greece by the other countries of the Eurozone, led by Germany, the imperialist heart of Europe. The economy in Germany is relatively healthy; Germany has emerged as a winner of the crisis, while its government’s policies are worsening the crisis in southern Europe. The majority of the population follows a nationalist consensus and supports their government. In this article, I will take a look at the left movement in Germany fighting under these circumstances. The new social movements that arose from the student rebellion of 1968 led to many new leftist organisations and activists. Some of them were the so-called “K-groups”, orthodox Communist groups who were often sectarian. In the 1980s activists who criticised these hierarchical structures formed the autonomous movement, which is made up of small local groups and projects such as squats and social centres, rather than big organisations. In the early 1990s the rise of nationalism and neo-nazism which accompanied the so-called ‘reunification’ of East Germany by the West made anti-fascism the main issue for the autonomous left. Recently, formerly autonomous groups have begun to confederate into nationwide (or bigger, including groups from Austria) networks or organisations, which could be called post-autonomous. One problem with the autonomous groups was that their informal structures were often opaque, incapable of learning and inadequately organised, while informal hierarchies continued to exist. Meanwhile, the social question became more important with the neoliberal reforms of the welfare system carried out by the social-democratic/Green coalition government in the beginning of the 2000s, and now with the economic crisis and austerity. This showed to focus only on anti-fascism is not enough. Major antifascist groups broke up, with sections joining post-autonomous organisations like the Interventionist Left. The Interventionist Left is probably the biggest of these post-autonomous organisations. It is very active in social movements and mainly focuses on mass mobilisations for actions of civil disobedience. For these mass actions, the IL tries to build broad movements that go beyond the radical left, including groups from civil society such as church groups. They see themselves as the organising and radicalising part of the left. The IL was formed as a network in 2004, but last year it started a process to form an organisation. This step probably means they will no longer only work as a campaigning network, but also do more theoretical work and act more strategically. They have published a piece that describes the basis for their politics. Nevertheless, they do not dogmatically follow one theoretical school. The IL describes itself as antagonist towards the state, however in comparison with other organisations of the radical left it has often been seen as the one that still works closest together with the party DIE LINKE, a left-wing reformist party with some anti-capitalist factions in it. Another important network that could be described as post-autonomous is the anti-authoritarian communist alliance “…ums Ganze!” (UG – “Everything is at stake!”). It was founded 2006 to make a radical critique of capitalism and oppression visible on an supraregional level. In the beginning, they focused a lot on theory and on criticising mass mobilisations of the left that did not push forward a radical critique, such as the 2007 mobilisations against the G8. However, in recent years they have done more and more work within movements (such as Blockupy), trying to make their critique visible within those. UG has a strong focus on anti-nationalism and is more critical of political parties than the IL. On a European level, they are organised in the platform “Beyond Europe” together with anarchist and anti-authoritarian communist groups from other countries, such as Alpha Kappa (Anti-authoritarian Movement) from Greece. The “New Anticapitalist Organisation” (NaO) is another organisation of the radical left that is currently being formed. Many groups that are confederating into the NaO do not come from autonomous traditions, but from Trotskyism. However, recently “Antifascist Revolutionary Action Berlin” (ARAB) joined the NaO, so that it is now a merger of post-Trotskyist and post-autonomous organisations. The ARAB played a big role in the left scene in Berlin, for example in organising the Mayday demonstrations. The NaO is still quite new and therefore not that visible and active yet, even though they had a successful campaign to raise funds for the YPG and YPJ, Kurdish self-defence forces fighting Da’esh aka ISIS in Rojava (Western Kurdistan/Northern Syria). The IL and UG are both active in the Blockupy alliance that organises annual Days of Action in solidarity with the population of Greece and other countries that bear the brunt of austerity policies. So far the Days of Action have mainly taken place in Frankfurt, where the European Central Bank, a part of the Troika that imposes austerity, has its headquarters. Blockupy is a broad alliance with all parts of the left represented. It connects the struggle against austerity in tandem with other struggles, such as against gentrification or supporting feminist or refugee struggles. The Days of Action usually involve blockades of the ECB, decentralised blockade actions against other targets and demonstrations. A climax of the mobilisation was the Day of Action on March 18 this year against the opening of the ECB’s new building. The protests were accompanied by riots, triggering a debate about militancy as some spokespeople of the alliance criticised the militant actions. It was feared that this debate might destroy the Blockupy alliance. This has been proven wrong, as shown by the many actions organised by Blockupy since March 18. They took part in the demonstration “Remake.Europe” on 20 June in Berlin, and organised demonstrations to show solidarity during the referendum in Greece. Delegates from Blockupy also travelled to Athens during the referendum and the events that followed, and wrote about their experiences and political thoughts on a blog. In October, Blockupy will join the protests against the EU summit in Brussels and for next spring they plan Days of Action in Berlin. The state of the left in Greece and the role of Syriza, as well as the question of staying in the Eurozone or not, are also debated in the German left. However, these debates might not be that important in Germany, because we should focus on fighting our government. The capitulation of Syriza is also a failure of the left in Germany, which didn’t succeed in questioning the status quo enough and thus allowed the German government the confidence to force Syriza into capitulation. Someone who had asked activists in Greece how Germans could support them told me that they replied: “Do something against Merkel!”. So this will be the challenge for the left in the next couple of years. For this, it is great that Blockupy keeps working and that they move the focus of their actions to Berlin. It is also useful that we have big radical leftist organisations and networks that can fight for an anti-capitalist perspective. These organisations do not replace all autonomous structures, in my opinion. It is still important to have local autonomous groups that can bring new dynamics into the left or that can focus on local struggles such as fighting neo-Nazis in their neighbourhood. We need a diverse movement in order to be strong. When autonomous and post-autonomous groups and other factions of the left join forces and unite different struggles from anti-gentrification to train driver’s strikes and from feminism to refugee’s protests, we might have a chance of changing the power structures of Europe one day. It is necessary.